Grammar has finally let its hair down! 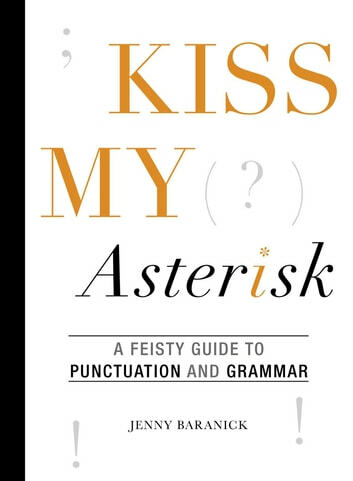 Unlike uptight grammar books that overwhelm us with every single grammar rule, Kiss My Asterisk is like a bikini: it’s fun, flirty, and covers only the most important bits. Its lessons, which are 100 percent free of complicated grammar jargon, have been carefully selected to include today’s most common, noticeable errors-the ones that confuse our readers or make them wonder if we are, in fact, smarter than a fifth grader. What is the proper use of an apostrophe? When should an ellipsis be used instead of an em dash? Why do we capitalize President Obama but not the president”? And why is that question mark placed outside of the end quote? Author Jenny Baranick is an English professor whose students can’t believe she’s actually that into grammar. Upon experiencing the joys of grammar at an early age, raising grammar awareness became Jenny’s raison d’être. By spreading her remarkably user-friendly and hilarious approach to grammar, she hopes everyone will experience the satisfaction of a properly placed comma, a precisely used semicolon, and a correctly deployed en dash. 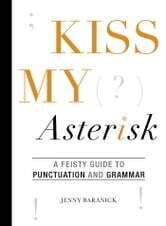 Kiss My Asterisk shows grammar as it’s never been seen before: uncomplicated, laugh-out-loud funny, and, dare we say, a little risqué.